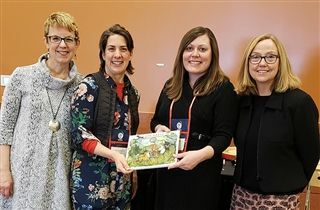 On November 10, teachers LuAnn Hayes, Becky Gallion, Heather Ribblett, and artist in residence Talleri McRae made a presentation about interdisciplinary STEAM projects at the American Orff-Schulwerk Association’s Professional Development Conference in Cincinnati, Ohio. The teachers had a wonderful time sharing STEAM inspirations with music and movement teachers from around the world. Sharing with an audience of 150 conference attendees, our teachers presented their planning process for developing STEAM units as well as their recent Rainforest unit for second graders. KCD second graders recently completed this Rainforest unit, which connected curriculum in science and technology, art, music, and drama. At the culmination of the unit, students performed a short program in front of their peers that demonstrated all of their work.